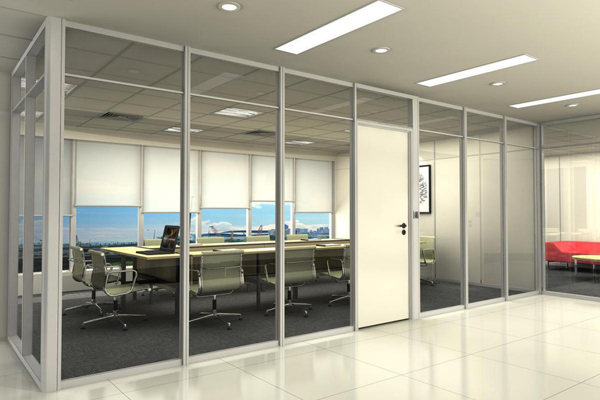 Office partitions also known as glass office partitions, the main function is to use glass as partition to divide space according to demand, more reasonable use of space, meet a variety of home and office uses, office partition walls are usually tempered glasses, with wind pressure resistance, impact, and other advantages, so safer, tighter and more durable.profile wall thickness:1.2mm /1.4mm /1.6mm/ 1.8mm /2.0mm.the module and the frame are fixed by a ballast; the keel and the office partition panel are connected by a mechanical fixing type and a button type pressing strip, and the connection modes are an L-shaped connection, a T-shaped connection, and a cross connection, and a universal connection greater than or equal to 90 degrees can also be achieved. The door frame meets the modern design and is equipped with 10-12mm thick glass door, 40mm thick wood, flat mouth, double glass door, and double wooden door. The matching hinges of the sealing seal of the door frame improve the soundproof effect of the door. The column width of about 100mm can be divided into manual and electric two kinds of shutter control. The opening and closing of the blinds can be easily realized, and the turning angle of the blinds can also be adjusted so as to achieve the best lighting effect in the room. There are two kinds of glass louver widths: 16mm and 25mm. The blinds can be built in the middle of the double glass. Skirting board height:40mm、60mm、80mm、110mm，cover installation and removal easy, beautiful and easy to track maintenance. panel span up to 2400mm, the gold separated. There are three types of materials based on Gaoyou office partition systems: single, double and artistic glass, of course, everything is done according to customer needs, high-quality partitioning works should be good lighting, soundproof and fireproof, environmental protection, easy installation and reusable glass, according to the type of glass main material: single glass partition, double glass partition, laminated glass partition, vacuum glass partition.